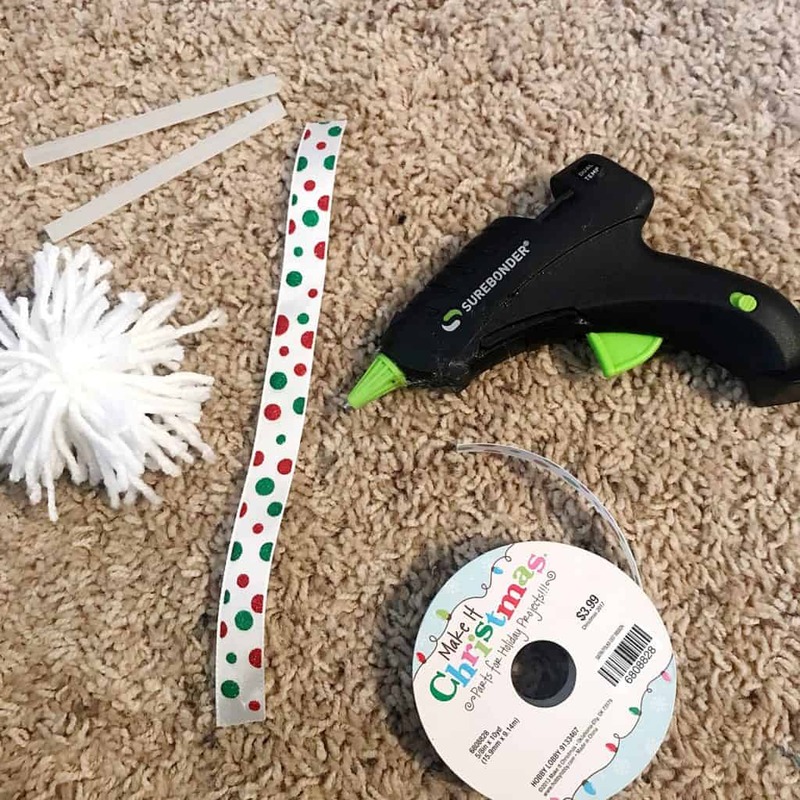 Make this Easy Dollar Store Ornament Wreath for less than $10. Hi friends! I hope you are having a good week so far! 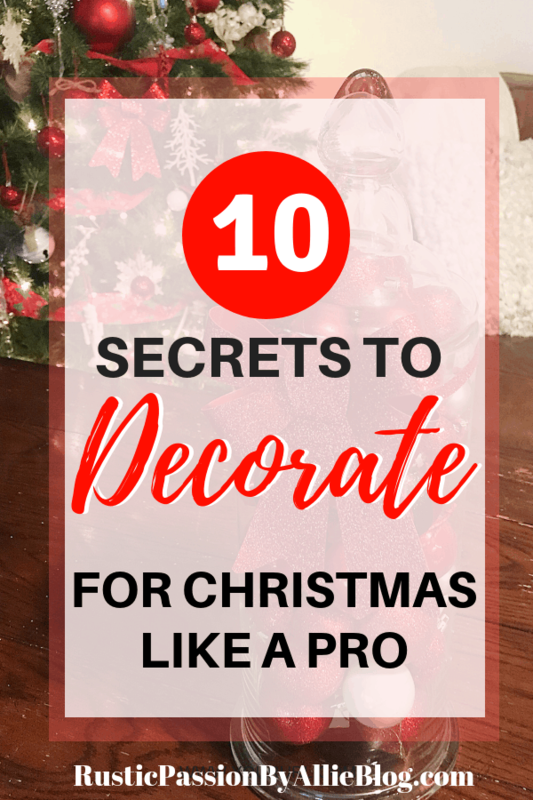 If you have been following the blog for a while I’m sure you have seen all the fun DIY Christmas Crafts I have been making for the past couple months. 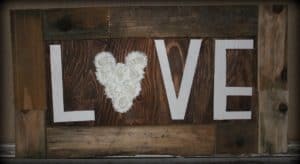 My favorite thing is making crafts on a budget that anyone can afford. 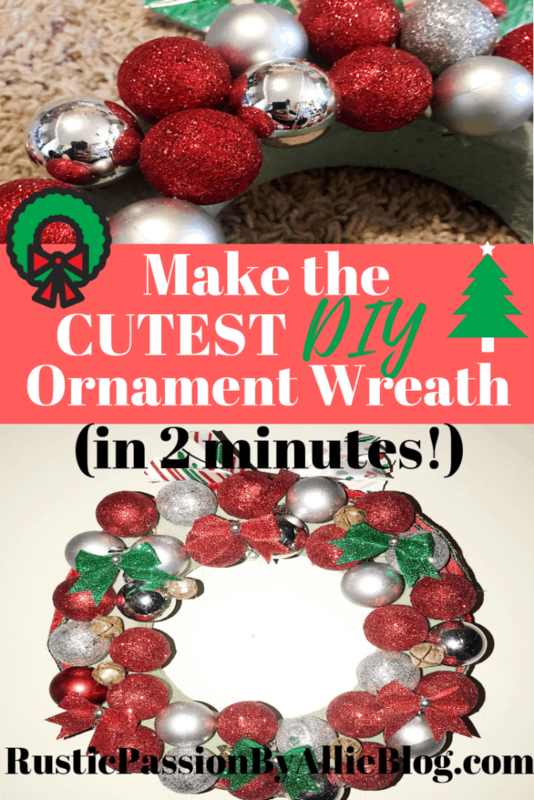 You will love making this ornament wreath for less than $10. It only took a few minutes to make and turned out so cute! 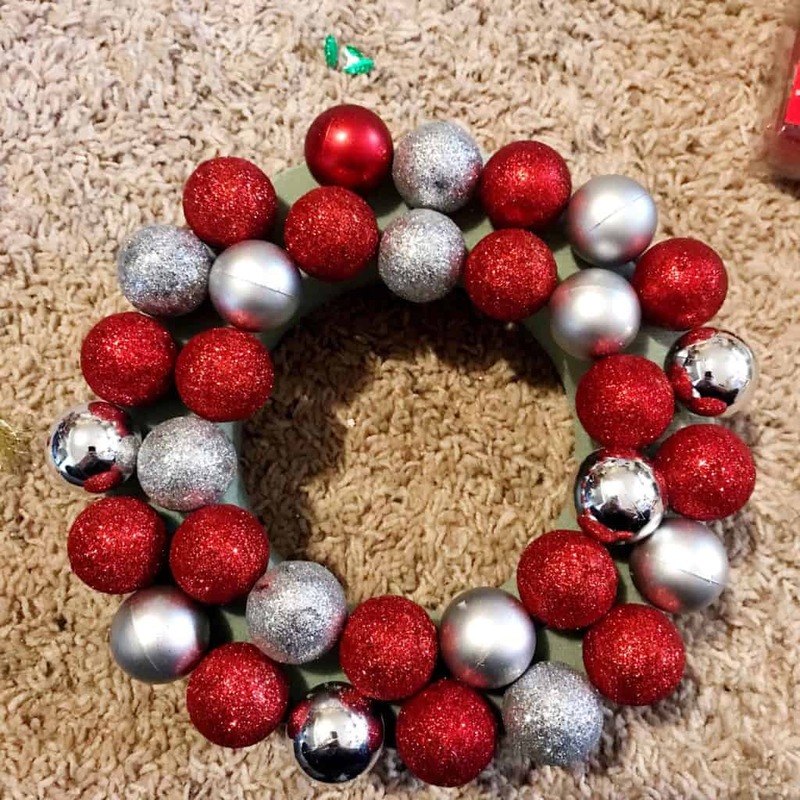 I pushed the top of the ornament into the Styrofoam wreath. 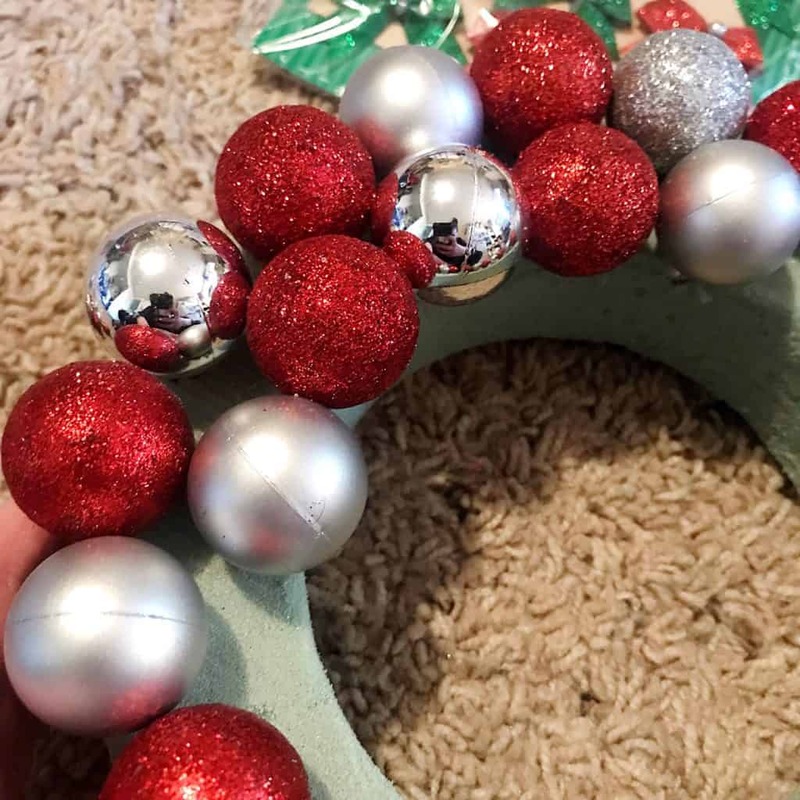 Then hot glued them into the wreath as well as glued the sides of the ornaments together. 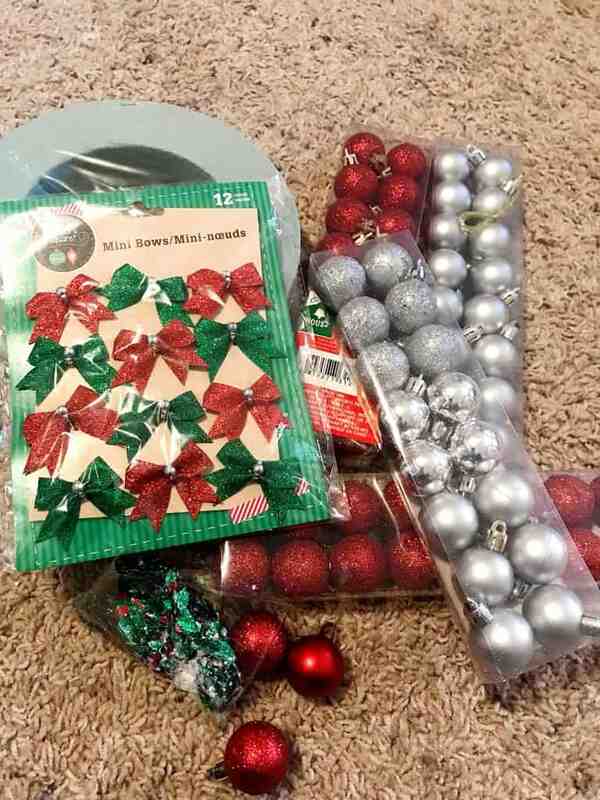 I arranged the ornaments silver and red every other one. 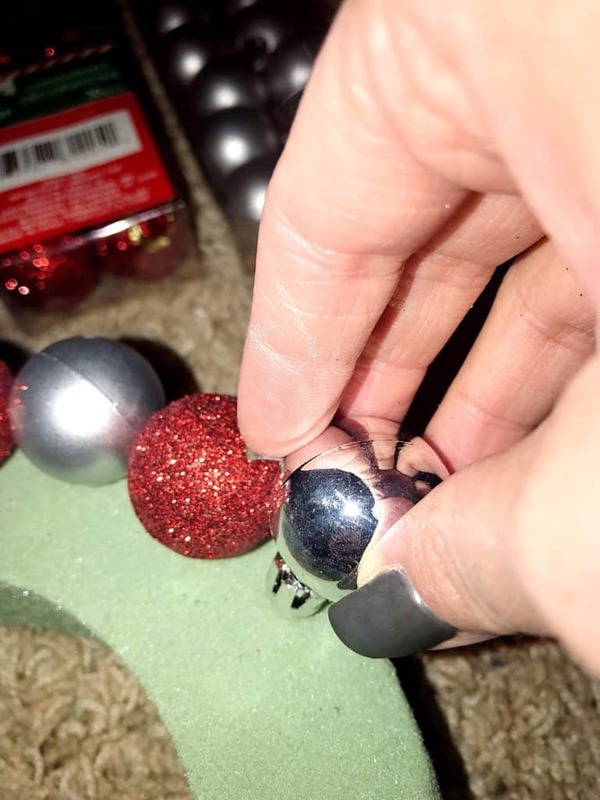 There were some open areas where the ornaments didn’t touch. I hot glued bows and bells to cover the space. 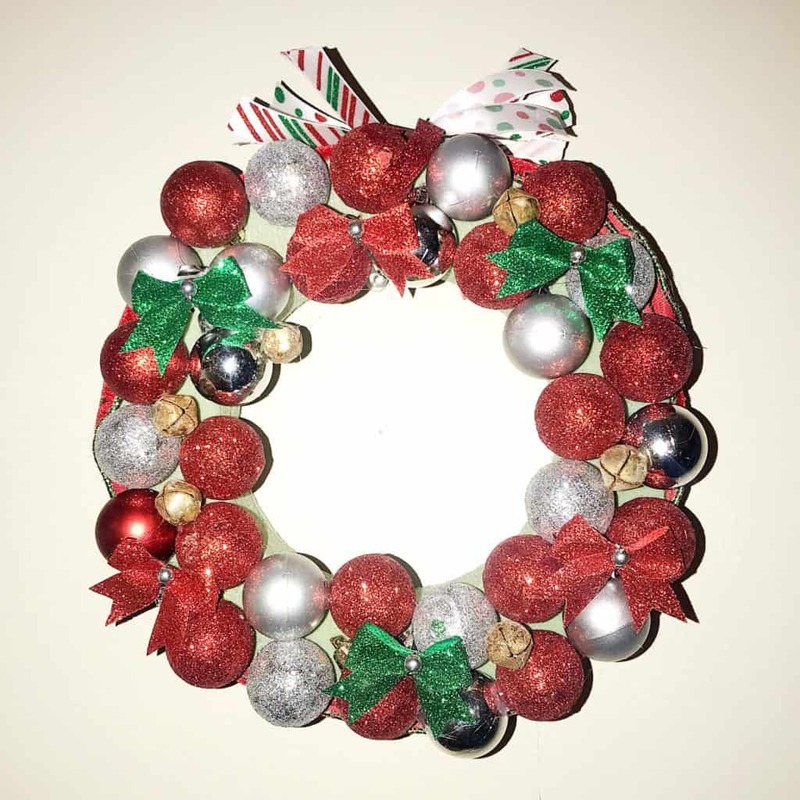 Then at the top of the wreath I glued a big bow I made with Christmas ribbon. I think it turned out adorable the best part was that it took a few minutes to make! 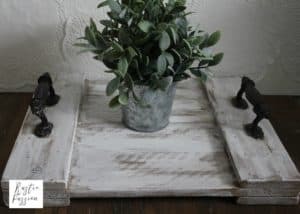 I am so glad you stopped by the blog. Don’t forget to tag me on Instagram in your Christmas crafts. 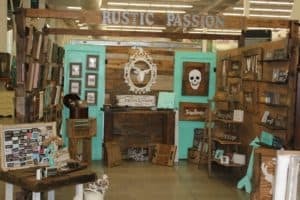 I love seeing all the fun projects you guys are working on. 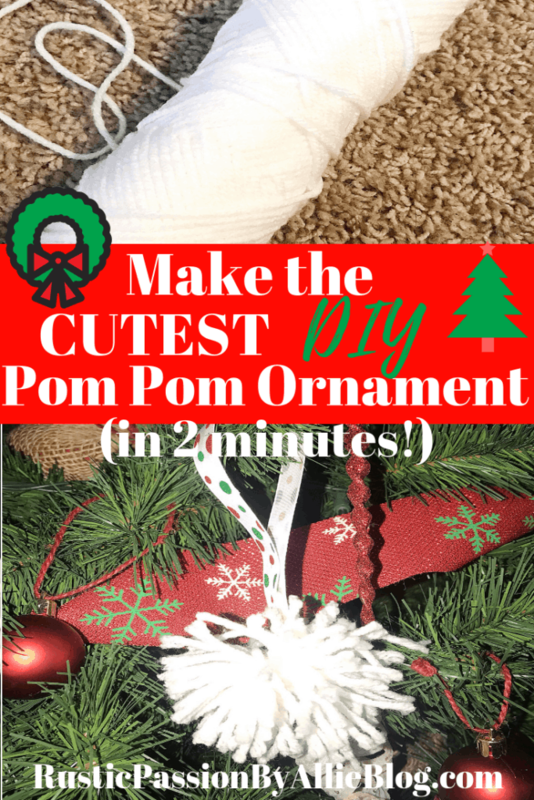 Make the Cutest Pom Pom Ornament in 2 Minutes! 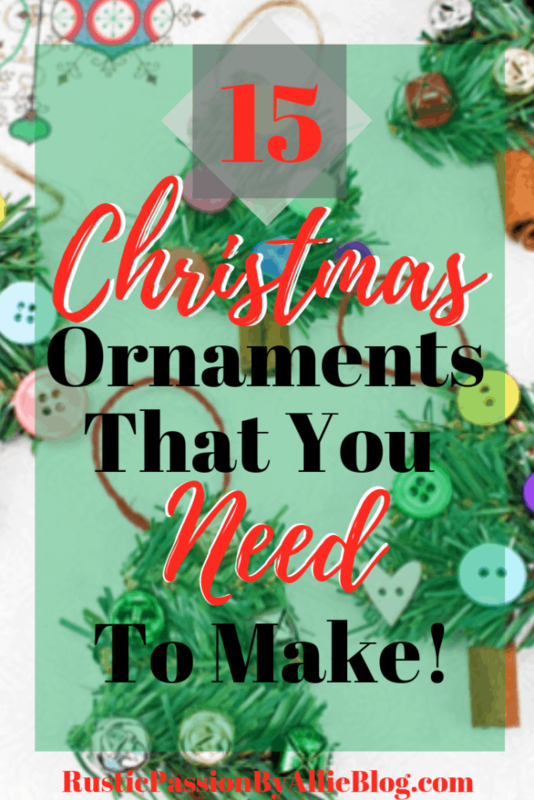 So I have been on a kick with making DIY Ornaments this year. 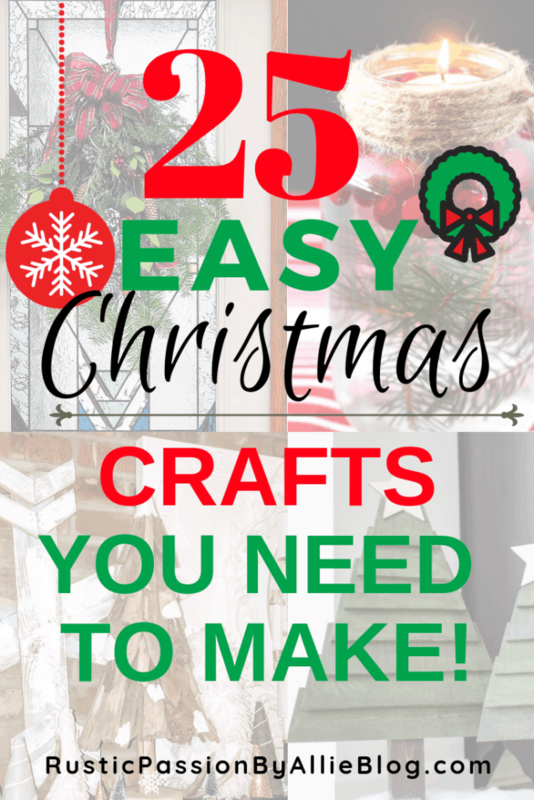 It’s such a fun Christmas Craft and the options are endless. 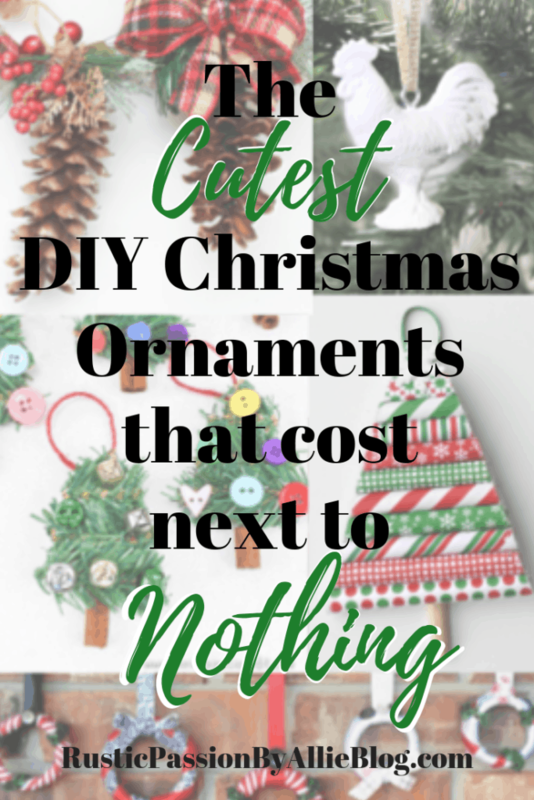 You can see some of my favorite DIY ornaments and DIY Christmas Crafts here. 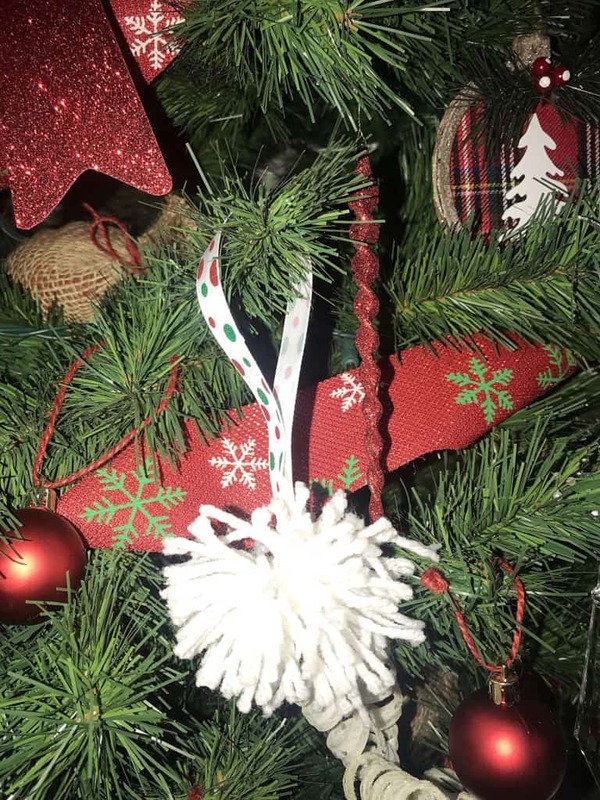 This DIY Pom Pom ornament craft is quick and will cost next to nothing to make. 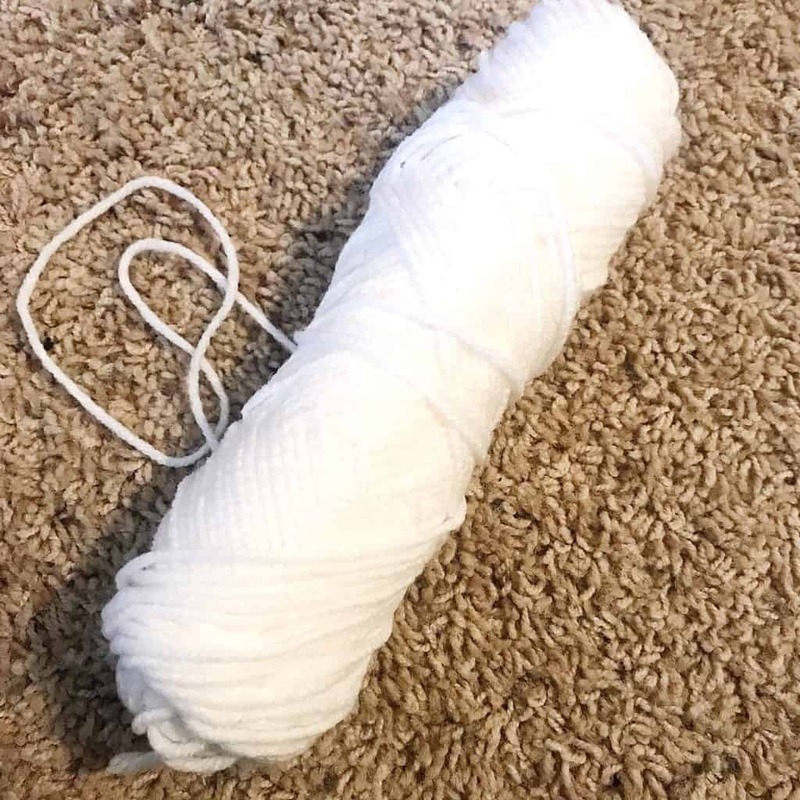 You will start with a large bundle of yarn. Any color will do! I made a White Christmas pom pom garland for my mantle this year. So I used left over yarn I had to make this ornament. 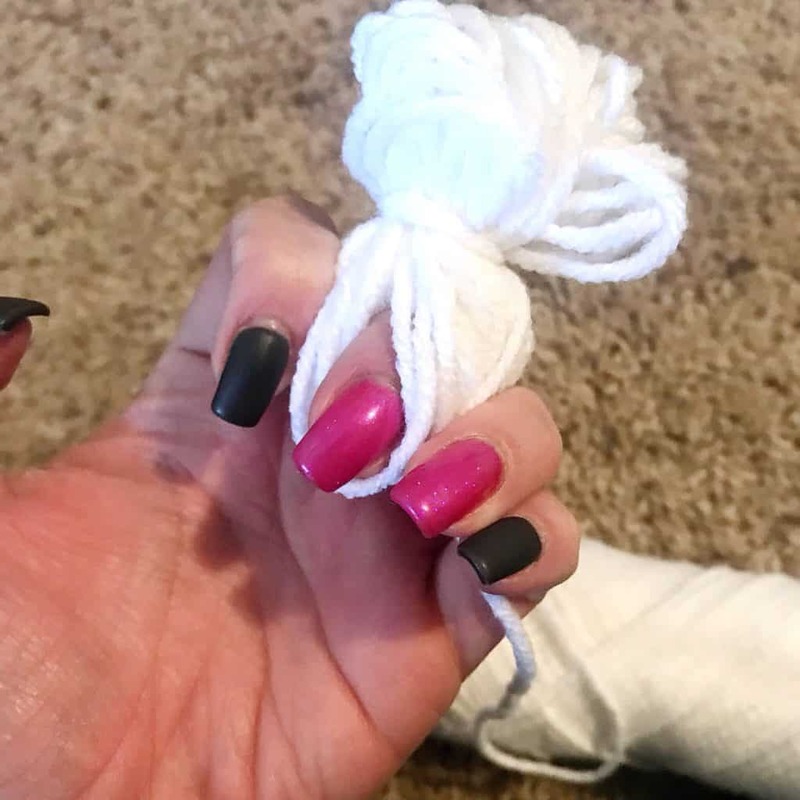 To start just wrap the yarn around your fingers. I found it was so much easier to slip off my hand at the end when I spread my fingers apart a bit. 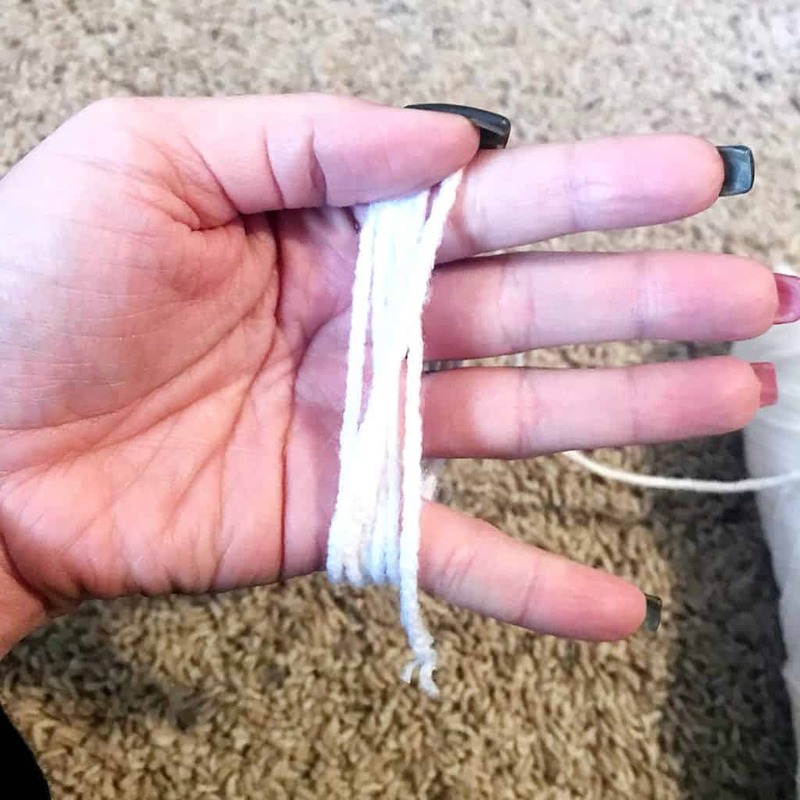 You will want to make sure you secure the middle by tying around a piece of yarn multiple times. This will create tons of loops. 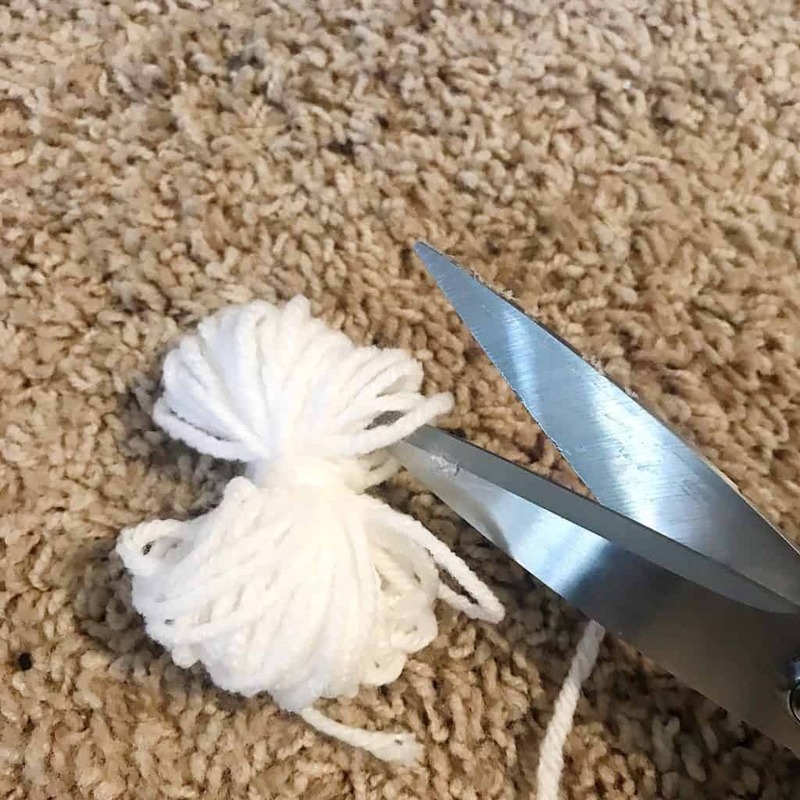 Next you will cut the loops to create the pom pom ends. Here is what it will look like after it has been cut. 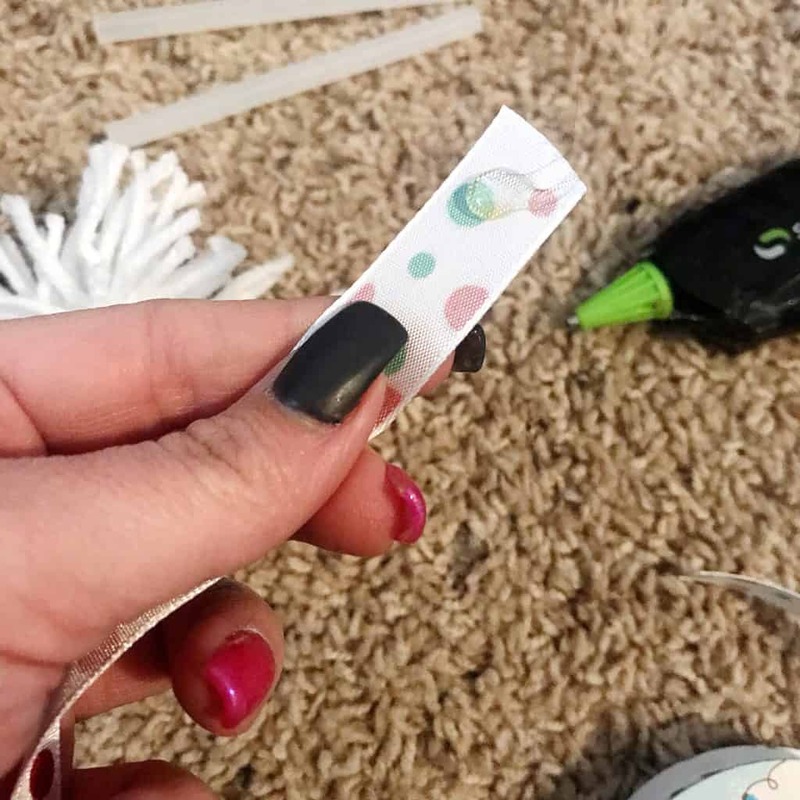 Next you will hot glue your ribbon onto one of the yarn strands. 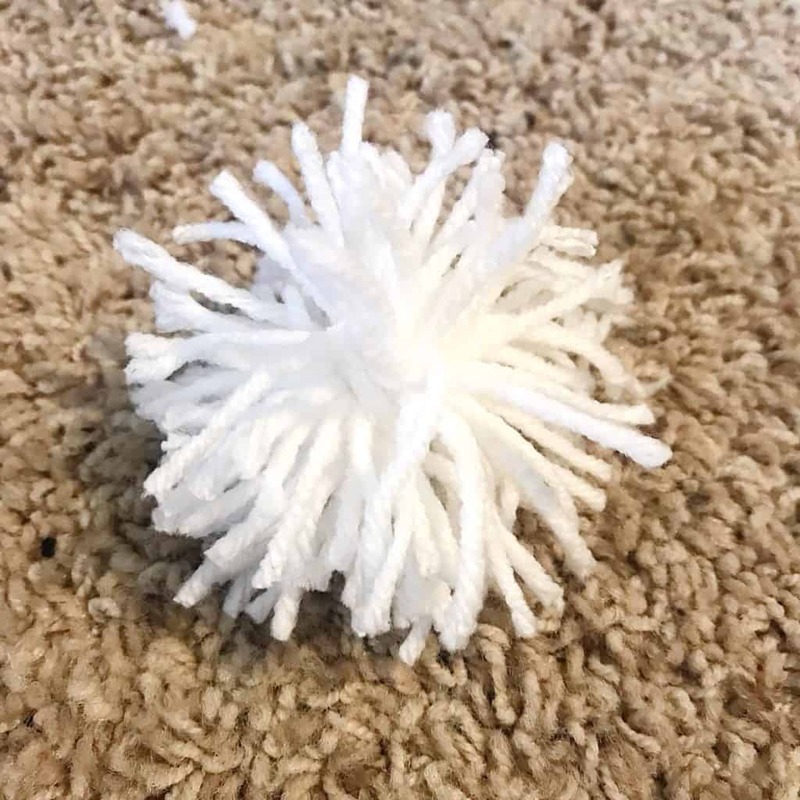 Here is the finished DIY pom pom ornament. 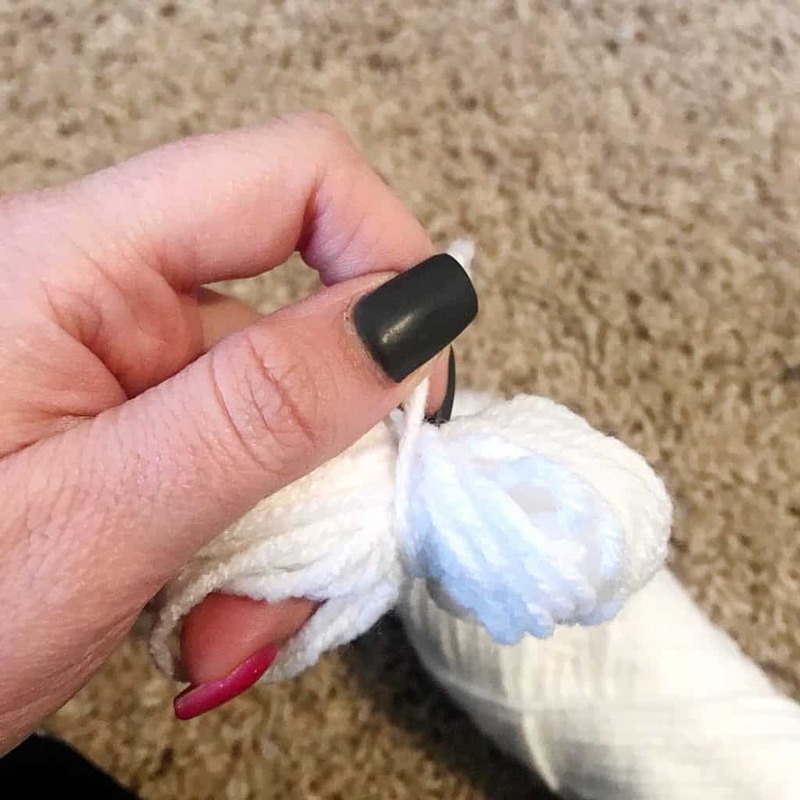 It is so cute and easy! 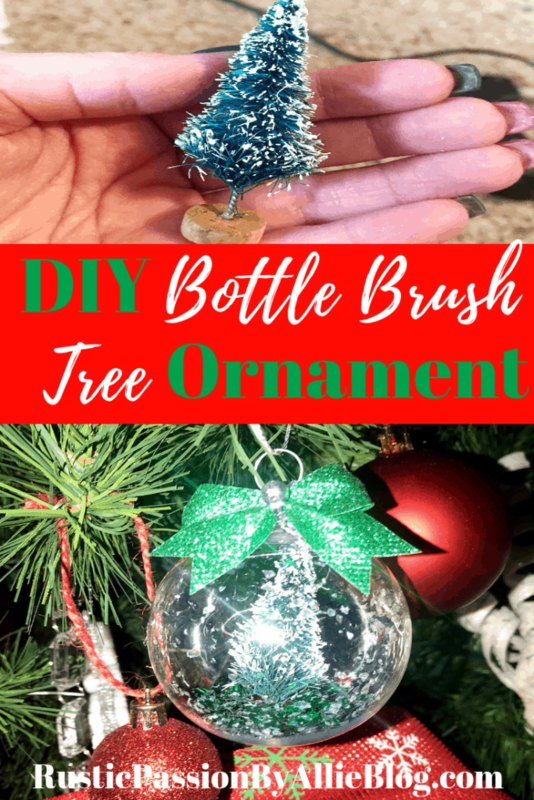 You can make tons of different sizes like I did to go all over your tree! 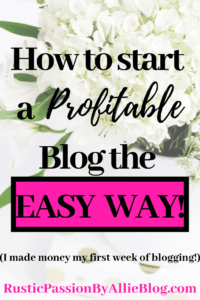 I am so glad you stopped by the blog! 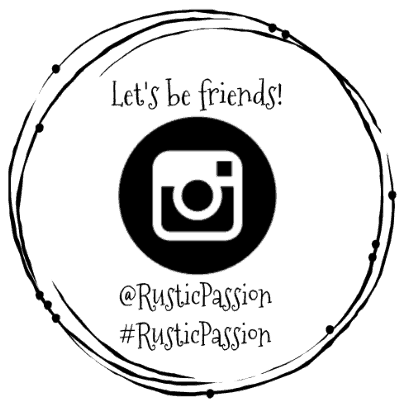 If we aren’t already friends on Instagram. Come find me! 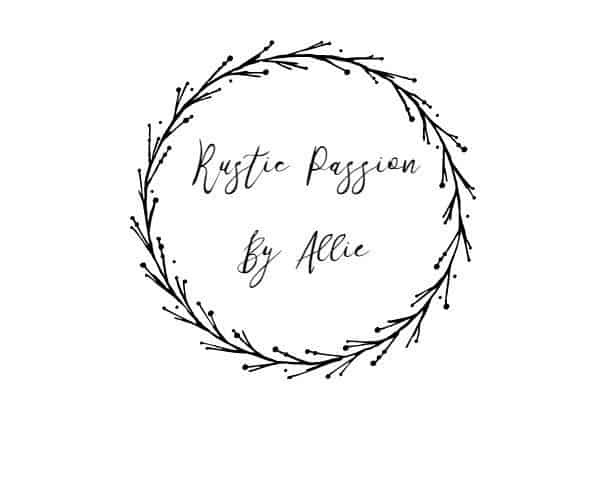 I love when you tag me in all your fun DIY crafts!